The longest total lunar eclipse of the century will last 6 hours and 14 minutes and can be seen from India. The most recent total lunar eclipse happened on January 31 this year. According to NASA, the eclipse lasted for a total time of 3 hours and 23 minutes, in which it was a 'total' elipse only for 1 hour and 16 minutes within that time. It was visible from Asia, Australia, the Pacific, and western North America. Now, we're going to see yet another total lunar eclipse on July 27. Only this time, NASA predicts it'll last for 1 hour and 43 minutes, which is the longest in this entire century. The penumbral eclipse will begin at 11:44 PM IST and be followed by a partial eclipse at 11:54 PM. The total lunar eclipse will begin at 1:00 AM on July 28. The maximum eclipse is expected to happen at 1:51 AM. The total eclipse will end by 2:43 AM. The partial eclipse will start again at around 3:49 AM, and by 4:58 AM, the penumbral eclipse will end. All put together, the eclipse will last for 6 hours and 14 minutes. The lunar eclipse will be visible from East Africa, South America, West Asia, and Central Asia. Chandrayaan finds water on the moon; lunar colonies on the horizon? A total lunar eclipse only when a full moon enters the umbra. The earth's atmosphere scatters colours with short- and mid-sized wavelengths away from the umbra. However, red light refracts around the planet and enters the darkest portion of the shadow. Because of this, the moon looks blood red during a total lunar eclipse, thus leading us to call this a 'blood moon'. 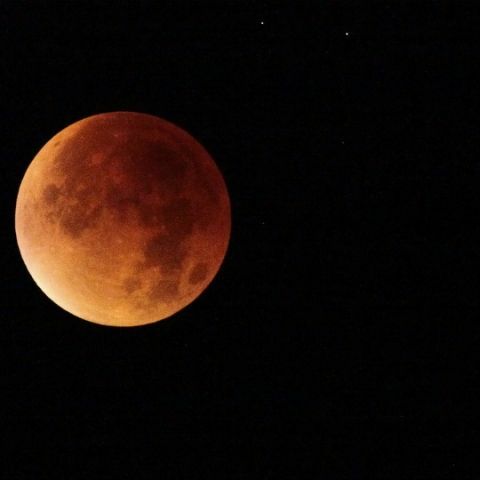 Blood moons are rare, and this new longest lunar eclipse will mark a tremendous milestone for all of humanity. What's more, earth will be passing between sun and Mars throughout the months of July and September. On the day of the eclipse, Mars will be in the best opposition in the sky since 2003. What it means is that observers across our planet will have the brightest view of the red planet in 15 years.